For some time now I have been planning a timeline of my forthcoming writing projects. Since I first drafted this things have already slipped a bit so I have had to revise the dates! Life, eh? My priority is to rewrite and polish things that already exist in draft, then move on to new projects where I can experiment with fresh styles and structures. I like variety, which is why the subject matter changes from work to work. An action-horror novel set on a remote Welsh island. I planned to have it finished and published by January 2012. I kept to the deadline! A story about a science-obsessed yet childish man changing his life for the better. First draft of a blurb here. I planned to finish this by July 2012, it is now likely to be September 2012. A collection of short stories about relationships. I already have the collection written, so this would be a re-write and selection exercise. There may be enough material with my new short stories to lead to a second collection at some point. Stories include an unwilling mother dealing with pregnancy; the gradual realisation that a relationship is over; and a three-in-a-bed swing session that doesn't go as planned. September 2012 - February 2013. A novel about two people who are ideal for each other: however, they fail to realise this due to misinterpreting motives and being too scared to act. Will they overcome their stupidity? This has been a project for a long time - I want to either finish it or nuke it from orbit. "It's the only way to be sure." February 2013 - December 2013. A collection of poems, maybe illustrated (in which case print-only). I'm not sure about going ahead with this, so the first part of the project will be revisiting the material and establishing whether the quality is worth it. I like the idea of the change of format though. January 2013 - April 2013. A collection of horror/dark short stories. Around half have been written but need varying amounts of surgery, others are in note form and await me sewing flesh onto the bones. Stories include: a man who goes to visit his unstable mother and finds that the past can regress you back to a terrified child hiding in a cupboard; a Russian hospital where the 100% successful anti-cancer surgery has an ominous requirement; and a Welsh farming village where the newly arrived, unhappy city boy finds that something living in the strange tunnels under the houses wants to have a permanent friend. 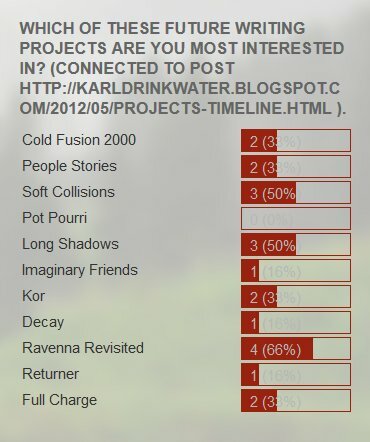 All the following projects are ones that I have collected notes on for years but have not started to write. As such, some of them might be dropped if I find that I can't use them to tell a satisfying story. For now I'll over-estimate the time required. Imaginary Friends is the story of a man who has trouble coping with reality. In the end he has to choose between a woman who loves him, and the friends from his mind who have been with him since childhood. A sci-fi action horror. Arriving in a town to discover weird fog and naked, silent, heavily-scarred humans is not a great start to a conference, especially when they beat you, tie you up, and put wires under your skin. Before long the protagonist is embroiled in a millennia-old battle with an ancient, indestructible, and alien being far away on an inhospitable planet. January 2015 - December 2015. The end of civilisation is coming. Everything we did wrong has come back to haunt us. January 2016 - December 2016. An academic who specialises in Byron finds his life is falling apart. Disgraced in work, and his wife furious at his ongoing affairs, he departs England to research a new work based on Byron's last years. However, as his own life begins to mirror that of Byron's, he wonders whether he can stop the collision-course to destruction. January 2017 - December 2017. The sequel to Turner. Chris wanted to retire, but sometimes the past comes back to bite you. The adventure involves a return to Ynys Diawl, a tense journey with the brother of a man he'd killed, and an explanation of why Chris was on the run in the first place. Can he turn things round again and come out on top? That lot should keep me going for some time! I'll put a poll up on the navigation bar, please let me know which projects you think sound best. Or use the comments below. The order of projects and their chance of coming to fruition may be affected by demand. A novel about a boy's relationship with his mother, told in reverse with each chapter being a vignette, such as my Sweet Nothing short story which got some really good feedback despite being upsetting and emotional. I don't write fantasy. But it would be fun to let rip on a 250,000 word fantasy novel based on some stories and role playing campaigns I used to run. Each character's story would stand alone, but as the stakes go up and an over-arching plot is discovered they end up joining forces - not always willingly. Some other horror projects I have planned. Psycho Hospital - keeping details of this secret, but expect something completely horrible - is James in hospital, or in hell? Horsemeat - set in Ireland. A community gone mad, a family who will do anything to survive, even if it means losing everything. All that should keep you out of mischief.